We welcome you to attend our 36th annual Maumee Bay Carvers Show and Competition to be held Sat., August 26, 2017. Carvers of all skill levels are encouraged to compete by entering their working decoys and shorebirds which will be judged and awarded various prizes including cash, rosettes and ribbons. This family-friendly event is a great opportunity to view beautifully carved decoys and shorebirds made by hand in the tradition of the American hunting style decoy. The decoys and shorebirds range from simplistic hunting style designs to ornately decorative forms that are often hard to determine from the actual live bird. Following the tradition of waterfowl hunters, the working decoys are floated in water and judged as to how their appearance would attract live waterfowl. The shorebirds are displayed and judged by category. Registration for carvers is 8 am. to 10 am. and judging begins after registration. ​ A Sell and Swap meet will also be held relating to hunting items, decoys, and carving and wood supplies. Admission to the show is free and there is a small entry fee for the competition. Over 36 years ago, the Maumee Bay Carvers Association was organized with the purpose to promote, preserve and mentor the art form and tradition of carving and painting waterfowl. Whether you are a beginner or advanced carver, we also invite you to attend our free Wednesday carve-along sessions held at the Woodcraft Store, 5311 Airport Hwy, Toledo, Ohio 43615, from 4:30 to 6:30 pm. Bring along your current project or we will help you get started with carving tips, advice and lots of fun. 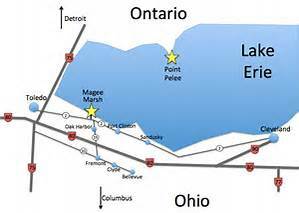 Where: Magee Marsh State Wildlife Area Check-In Station, 13229 West State Route 2, 43449.
east of Toledo and north of Oak Harbor, OH., 43449. Registration: 8 am. to 10 am. Entry fee: $10 for first decoy/rig, $5 for each additional decoy/rig. Entry fee cap is $50. Youth 17 and under entries free. Sell or Swap Event: If you have hunting items, decoys, carving items, wood supplies, etc., and would like to sell or trade them, bring them to this event. There is no cost and tables will be provided. Note to Carvers: Any carver may enter the Open Class. However, you must enter the Open Class if you have won a first, second or third Best of Show or numerous Best of Category awards.Previous Best of Show winners at the Maumee Bay Carvers Show must move up to Open Class. Visible markings that identify the carver must be covered. Machine duplicated decoys will not be allowed. Decoys must be constructed of a practical material, individually hand crafted and painted. Decoys entered in one contest can’t be moved into another contest. Click here to view Rules and Entry Form Page.